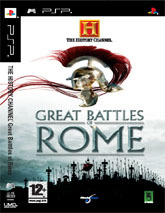 History Channel: Great Battles of Rome is a real-time strategy game for the PSP that combines historically accurate information with modern day gameplay that unfortunately leaves the viewers cussing their PlayStation Portable with its fiddle some control system and frustrating game mechanics. Developed simultaneously for Playstation2, PSP and PC. Highlights 14 Roman Campaigns and more than 100 of the most significant battles of the Roman Empire. 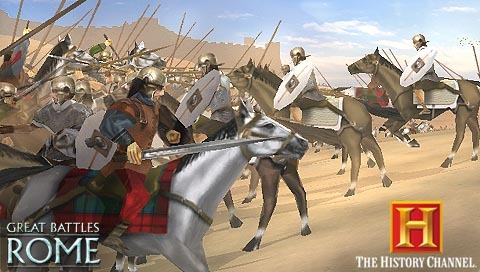 Includes 10 Celtic campaigns from the barbarians perspective and 35 fantasy battles in the Cult of Mithras (PSP Only). 50 minutes of captivating program footage from The History Channel(R). Unique soundtrack and voice talents narrate the story of Marcus Aurelius. More than 20 troop types. Unique and intuitive user interface for PSP (PlayStationPortable) and Playstation2. Game controls allow command of up to 20 squads simultaneously. Customizable troops and battle conditions. Innovative combat model specially adapted for PSP and Playstation2. Incorporating special visual effects and advanced levels of detail including night battles. Realistic battlefield conditions and terrain effect the underlying complex battle engine. The presentation of History Channel: Great Battles of Rome is a first class experience that features dramatic music and commentary, courtesy of the History Channel, however fails to truly delivery an enjoyable gaming experience. The PSP is a great console, however some games unfortunately don't translate too well to portable content and this game fits nicely into this category. 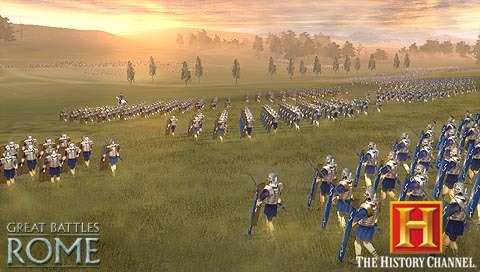 Giving orders to your troops or trying to control your entire armies is a rather frustrating experience as this game was originally designed on the PC to be used with a mouse. The PSP's analog stick and in-game menu system fails to deliver the accuracy of a mouse as you valiantly try to give your troops orders. However, it should be noted that the battles are quite realistic and contains real-world terrains from these ancient times. 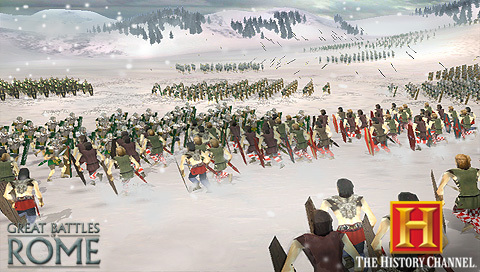 You can also give you troops a variety of different orders and with over 20 different types of units in the game, the developers have to extreme lengths at recreating the accuracy of these ancient battles. As this title is follows your traditional RTS game, players have a variety of options such as recruiting and upgrading your troops as you engage in over 100 different battles that is carefully split over three different campaigns. The game does have some highlights such as the interesting historical aspects of the title that is impressively done through in game cut scenes that depicts the history of this once great empire. Although I was quite impressed by the actual footage from the History Channel, however it would have been better to release it as a UMD, rather than a game to witness this. The title also contains an interesting multiplayer aspect that is as fiddle some as the main game mode. Graphically, the title looks quite decent on the PSP with the exception of a few levels that is rather "Spartan" but generally, the developers have done a great job at dumbing the graphics down for the PSP. Musically, the title contains a great "documentary" sounding soundtrack with realistic sound effects and great over the top and dramatic voiceovers. In conclusion, The History Channel: Great Battles of Rome is a hit and miss affair on the PSP that is probably a great game on the PC but the transfer to the PSP has unfortunately lost the playability. Definitely recommended for patient and lovers of Rome or check out the PC version!